Fifty years ago, the author of the US nuclear navy was remarkably prophetic about the situation that we now encounter. “In the face of the basic fact that fossil fuel reserves are finite, the exact length of time these reserves will last is important in only one respect: the longer they last, the more time do we have, to invent ways of living off renewable or substitute energy sources and to adjust our economy to the vast changes which we can expect from such a shift.” He identified the auto as “the most ravenous devourer of fossil fuels, accounting for over half of the total oil consumption in this country.” The speech clearly indicated that “our civilization rests upon a technological base which requires enormous quantities of fossil fuels. What assurance do we then have that our energy needs will continue to be supplied by fossil fuels? The answer is – in the long run – none.”A year before in 1956, a geologist named M King Hubbert presented a paper to the American Petroleum Institute where he predicted a peak production of US oil between 1965 and 1970. The actual date turned out to be 1971. His paper also indicated a world peak of oil in the year 2000. This has been found to be slightly erroneous, as the peak is now believed to occur between 2006 and 2013 by many analysts. In hindsight, his report is quite remarkable. It has become clear that producers outside of OPEC have no spare capacity and many have declining production. OPEC apparently does have spare capacity and could influence the price to some degree downward at the moment. But they seem to have discovered that the world economy can endure oil at a higher price than previously thought. When your choices are to raise production, have a lower price for fewer years or retain existing production levels at higher prices for a long time, the answer is simple. Who could blame them? I would love to own an oil well and sell a barrel for $100. The new floor price is probably $80 per barrel and will rise at least $12 per barrel per year, given no market turbulence. There is no upper limit to the price. Here in New Brunswick, the price of heavy oil used at Coleson Cove and Courtenay Bay for the current fiscal year is forecast to cost $291 million. This is up 25% over the previous year. The production cost of Coleson Cove power is roughly 11 cents per kWh. When the pet coke project is completed the cost will be reduced to 9.2 cents. This doesn’t include any 10% discounts from Venezuela or any large increases when the present hedging agreements are finished. The average cost of a kWh produced by NB Power last year was 8.6 cents per kWh (kWh’s sold / revenue). 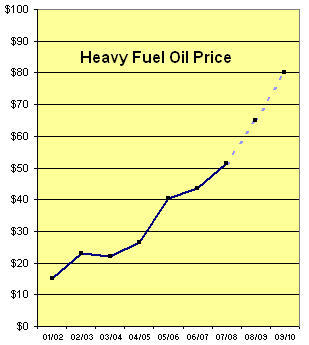 Within several years heavy oil will be $80 a barrel or much more – too expensive to burn at Coleson Cove. Can we find another fuel that is acceptable? Can we reduce our consumption of energy? Can wind power play a part? Where do we find the replacement power for 3.3 billion kWh’s? Or do we just accept 7% rate increase each year? The Minister of Energy Jack Keir indicates that a second nuclear plant could be in service by 2016 if the economics and other variables are favourable. Unfortunately, I see a perfect storm well before that date. The combination of our dependency on oil and world oil production limits doesn’t look good for our pocket books. The world is burning our capital in the bank (oil) like a drunken sailor.